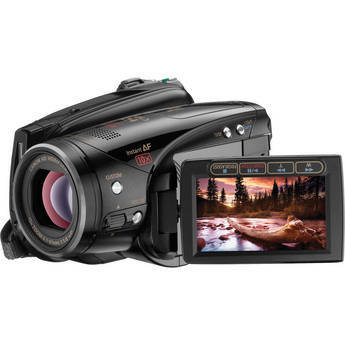 The Canon line of Vixia camcorders features a lot of variety and innovation. As a longtime lover of video cameras, I’ve always respected Canon products and the Vixia HV40 has a lot to offer for the right person. Canon promotes it to budding independent film makers and others who want to put a bit more creative artistry and passion into their videos. Are you that kind of video maker? One feature the HV 40 has to appeal to this audience is the ability to choose frame rates that helps make video simulate the softer look of film. Shooting in these frame rates also makes transfer between film and video more practical. Standard video is 30 frames per second (well, 29.97 really but let’s not be picky) and film plays at 24 frames per second. Some video cameras allow you to mimic film by giving you an option to shoot using the “24p cinema mode” for a more film-like look. People who want a video camera as a casual point-and-shoot camera honestly would not want to mess with such a feature but it truly is important to those who desire the artistic options. The HV40 records on mini DV tape, which is a long-standing, and extremely popular format stubbornly held onto by many. I personally love mini DV. 🙂 Sticking with mini DV can be advantageous, especially if you still have lots of mini DV equipment. On the editing sides, mini DV offers universal compatibility with existing technology. Mini DV is reliable, looks great and is easy to archive. However mini DV, and tapes in general, are a format a lot of forward thinking people would say is a dying format so why invest in it? I personally say that dire attitude is too negative and would just as soon mini DV never die out completely. Another feature made to appeal to the budding indie filmmaker, the Vixia HV40 captures a large, high def image: 1920 x 1080 high definition video. The HV40 video camera uses higher-grade, more expensive internal parts, including the more professional 2.96Mp CMOS sensor along with the DIGIC DV II Image Processor. If your video is destined for online use, this camera has the flexibility to shoot standard definition video as well as high def. If you need stills, the camcorder captures 3.1Mp still images to mini SD cards. I must say, Canon knows its audience and designs cameras aimed at a particular audience. For convenience, the HV40 also has a built-in flash for often need supplemental light. From an artistic standpoint, that light will be flat and harsh but it is better than nothing in many situations. For better artistic control, you can attach external lights via the Advanced Accessory Shoe which provides phantom power to your accessory. The lens seems pretty basic with a 10x optical and 200x digital. I used to use an older Panasonic mini dv camcorder. Decent quality but no connectivity to PC for editing. To edit I had to record to DVD using a DVR console connected to the TV, copy the files (.vob) to the PC, then convert the files to a format compatible with editing software… all just to begin editing. Nightmare! I’ve since used a mini Flip style camera, but wanting better quality. How would I connect the Vixia to my laptop – HDMI to HDMI? Yes, that does sound like a royal pain in the tush! I am 99% positive that the HDMI is just for hooking it up to a TV so you can watch your video on the TV. To transfer to a computer for editing you’d use the firewire or USB2.